"Otho I" redirects here. For the German king, see Otto I, Holy Roman Emperor. Otto (Greek: Όθων, Óthon; 1 June 1815 – 26 July 1867) was a Bavarian prince who became the first modern King of Greece in 1832 under the Convention of London. He reigned until he was deposed in 1862. The second son of King Ludwig I of Bavaria, Otto ascended the newly created throne of Greece while still a minor. His government was initially run by a three-man regency council made up of Bavarian court officials. Upon reaching his majority, Otto removed the regents when they proved unpopular with the people and he ruled as an absolute monarch. Eventually his subjects' demands for a Constitution proved overwhelming, and in the face of an armed but bloodless insurrection Otto in 1843 granted a constitution. Throughout his reign Otto was unable to resolve Greece's poverty and prevent economic meddling from outside. Greek politics in this era was based on affiliations with the three Great Powers, and Otto's ability to maintain the support of the powers was key to his remaining in power. To remain strong, Otto had to play the interests of each of the Great Powers' Greek adherents against the others, while not aggravating the Great Powers. When Greece was blockaded by the British Royal Navy in 1850 and again in 1854, to stop Greece from attacking the Ottoman Empire during the Crimean War, Otto's standing amongst Greeks suffered. As a result, there was an assassination attempt on the Queen, and finally in 1862 Otto was deposed while in the countryside. He died in exile in Bavaria in 1867. Otto was born as Prince Otto Friedrich Ludwig of Bavaria at Schloss Mirabell in Salzburg (when it briefly belonged to the Kingdom of Bavaria), as second son of Crown Prince Ludwig I of Bavaria and Therese of Saxe-Hildburghausen. His father served there as Bavarian governor-general. Through his ancestor, the Bavarian Duke John II, Otto was a descendant of the Byzantine imperial dynasties of Komnenos and Laskaris. When he was elected king, the Great Powers extracted a pledge from Otto's father to restrain him from hostile actions against the Ottoman Empire. They also insisted that his title be "King of Greece", rather than "King of the Hellenes", because the latter would imply a claim over the millions of Greeks then still under Turkish rule. Aged not quite 18, the young prince arrived in Greece with 3,500 Bavarian troops (the Bavarian Auxiliary Corps) and three Bavarian advisors aboard the British frigate HMS Madagascar. Although he did not speak Greek, he immediately endeared himself to his adopted country by adopting the Greek national costume and Hellenizing his name to "Othon" (some English sources, such as Encyclopædia Britannica, call him "Otho"). The Bavarian advisors were arrayed in a Regency Council, headed by Count Josef Ludwig von Armansperg, who, in Bavaria as minister of finance, had recently succeeded in restoring Bavarian credit, at the cost of his popularity. Von Armansperg was the President of the Privy Council, and the first representative (or Prime Minister) of the new Greek government. The other members of the Regency Council were Karl von Abel and Georg Ludwig von Maurer, with whom von Armansperg often clashed. After the King reached his majority in 1835, von Armansperg was made Arch-Secretary, but was called Arch-Chancellor by the Greek press. Britain and the Rothschild bank, who were underwriting the Greek loans, insisted on financial stringency from Armansperg. The Greeks were soon more heavily taxed than under Ottoman rule; as the people saw it, they had exchanged a hated Ottoman rule,[speculation?] which they understood, for government by a foreign bureaucracy, the "Bavarocracy" (Βαυαροκρατία), which they despised. In addition, the regency showed little respect for local customs. As a Roman Catholic, Otto himself was viewed as a heretic by many pious Greeks; however, his heirs would have to be Orthodox, according to the terms of the 1843 Constitution. King Otto brought his personal brewmaster with him, Herr Fuchs, a Bavarian who stayed in Greece after Otto's departure, and introduced Greece to beer, under the label "Fix". Popular heroes and leaders of the Greek Revolution, such as Generals Theodoros Kolokotronis and Yiannis Makriyiannis, who opposed the Bavarian-dominated regency, were charged with treason, put in jail and sentenced to death. They were later pardoned under popular pressure, while Greek judges who resisted Bavarian pressure and refused to sign the death warrants (Anastasios Polyzoidis and Georgios Tertsetis, for instance), were saluted as heroes. Otto's early reign was also notable for his moving the capital of Greece from Nafplion to Athens. His first task as king was to make a detailed archaeological and topographic survey of Athens. He assigned Gustav Eduard Schaubert and Stamatios Kleanthis to complete this task. At that time, Athens had a population of roughly 4,000–5,000 people, located mainly in what today covers the district of Plaka in Athens. Athens was chosen as the Greek capital for historical and sentimental reasons, not because it was a large city. At the time, it was a town consisting of only 400 houses at the foot of the Acropolis. A modern city plan was laid out, and public buildings erected. The finest legacy of this period are the buildings of the University of Athens (1837, under the name Othonian University), the Athens Polytechnic University (1837, under the name Royal School of Arts), the National Gardens of Athens (1840), the National Library of Greece (1842), the Old Royal Palace (now the Greek Parliament Building, 1843), and the Old Parliament Building (1858). Schools and hospitals were established all over the (still small) Greek dominion, Due to the negative feelings of the Greek people toward non-Greek rule, historical attention to this aspect of his reign has been neglected. During 1836–37, Otto visited Germany, marrying a beautiful and talented 17-year-old, Duchess Amalia (Amelie) of Oldenburg (21 December 1818 to 20 May 1875). The wedding took place not in Greece, but in Oldenburg, on 22 November 1836; the marriage did not produce an heir, and the new queen made herself unpopular by interfering in the government and maintaining her Lutheran faith. Otto was unfaithful to his wife, and had a liaison with Jane Digby, a notorious woman his father had previously taken as a lover. Due to his having overtly undermined the king, Armansperg was dismissed from his duties by King Otto immediately upon his return from Germany. However, despite high hopes on the part of the Greeks, the Bavarian Rudhart was appointed chief minister, and the granting of a constitution was again postponed. The attempts of Otto to conciliate Greek sentiment through efforts to enlarge the frontiers of his kingdom, for example, by the suggested acquisition of Crete in 1841, failed in their objective, and only succeeded in embroiling him in conflict with the Great Powers. Throughout his reign, King Otto found himself confronted by a recurring series of problems: partisanship of the Greeks, financial uncertainty, and ecclesiastical disputes. Greek parties in the Othonian era were based on two factors: the political activities of the diplomatic representatives of the Great Powers: Russia, United Kingdom and France and the affiliation of Greek political figures with these diplomats. 3) the promise of 60,000,000 francs in loans from the Great Powers, which kept these nations involved in Greek internal affairs and the Crown constantly seeking to please one or the other power to ensure the flow of funds. The political machinations of the Great Powers were personified in their three legates in Athens: the French Theobald Piscatory, the Russian Gabriel Catacazy, and the English Edmund Lyons. They informed their home governments on the activities of the Greeks, while serving as advisers to their respective allied parties within Greece. Otto pursued policies, such as balancing power among all the parties and sharing offices among the parties, ostensibly to reduce the power of the parties while trying to bring a pro-Othon party into being. The parties, however, became the entree into government power and financial stability. The effect of his (and his advisors') policies was to make the Great Powers' parties more powerful, not less. The Great Powers did not support curtailing Otto's increasing absolutism, however, which resulted in a near permanent conflict between Otto's absolute monarchy and the power bases of his Greek subjects. Otto found himself confronted by a number of intractable ecclesiastical issues: 1) monasticism, 2) Autocephaly, 3) the king as head of the Church and 4) toleration of other churches. His regents, Armansperg and Rundhart, established a controversial policy of suppressing the monasteries. This was very upsetting to the Church hierarchy. Russia was self-considered as stalwart defender of Orthodoxy but Orthodox believers were found in all three parties. Once he rid himself of his Bavarian advisers, Otto allowed the statutory dissolution of the monasteries to lapse. By tradition dated back to the Byzantine era, the king was regarded by the Church as part of her head. On the issue of Church's Autocephaly and his role as king within the Church, Otto was overwhelmed by the arcana of Orthodox Church doctrine and popular discontent with his Roman Catholicism (while the Queen was Protestant). In 1833, the regents had unilaterally declared the Autocephaly of the Church of Greece. This was a recognition of the de facto political situation, as the Patriarch of Constantinople was partially under the political control of the Ottoman Empire. However, faithful people—concerned that having a Catholic as the head of the Church of Greece would weaken the Orthodox Church—criticised the unilateral declaration of Autocephaly as non-canonical. For the same reason, they likewise resisted the foreign, mostly Protestant, missionaries who established schools throughout Greece. Tolerance of other religions was over-supported by some in the English Party and others educated in the West as a symbol of Greece's progress as a liberal European state. In the end, power over the Church and education was ceded to the Russian Party, while the King maintained a veto over the decision of the Synod of Bishops. This was to keep balance and avoid discrediting Greece in the eyes of Western Europe as a backward, religiously intolerant society. Greek society was in reality very tolerant of other religions. But after 400 years of religious oppression by the Ottomans, Greeks were very suspicious of imposed "Liberal European progress". Such forced "progress" was viewed as one more attempt against their faith and against their own understanding of freedom, as the main motto of the Greek Revolution was "for the holy faith of Christ and the freedom of the homeland"; home and faith were inseparable, given also that the Church was the main contributor to the survival of the Greek language and Greek consciousness during Turkish occupation. Catholic communities were already established in Greece since the 13th century (Athens, Cyclades, Chios, Crete). Jewish communities also existed in the country, those arriving after the Expulsion of the Jews from Spain (1492) joining the earlier Romaniotes, Jews who had been living there since the times of Apostle Paul. Muslim families were still living in Greece during Otto's reign, since hostility was mainly against the Ottoman state and its depressive mechanisms and not against Muslim people. Although King Otto tried to function as an absolute monarch, as Thomas Gallant writes, he "was neither ruthless enough to be feared, nor compassionate enough to be loved, nor competent enough to be respected." By 1843, public dissatisfaction with him had reached crisis proportions and there were demands for a Constitution. Initially Otto refused to grant a Constitution, but as soon as Bavarian troops were withdrawn from the kingdom, a popular revolt was launched. On 3 September 1843, the infantry led by Colonel Dimitris Kallergis and the respected Revolutionary captain and former President of the Athens City Council General Yiannis Makriyiannis assembled in Palace Square in front of the Palace in Athens. Eventually joined by much of the population of the small capital, the rebellion refused to disperse until the King agreed to grant a Constitution, which would require that there be Greeks in the Council, that he convene a permanent National Assembly and that Otto personally thank the leaders of the uprising. Left with little recourse now that his German troops were gone, King Otto gave in to the pressure and agreed to the demands of the crowd over the objections of his opinionated Queen. This square was renamed Constitution Square (Πλατεία Συντάγματος) to commemorate (through to the present) the events of September 1843—and to feature many later tumultuous events of Greek history. Now for the first time, the king had Greeks in his Council and the French Party, the English Party and the Russian Party (according to which of the Great Powers' culture they most esteemed) vied for rank and power. The King's prestige, which was based in large part on his support by the combined Great Powers, but mostly the support of the British, suffered in the Pacifico incident of 1850, when British Foreign Secretary Palmerston sent the British fleet to blockade the port of Piraeus with warships, to exact reparation for injustice done to a British subject. 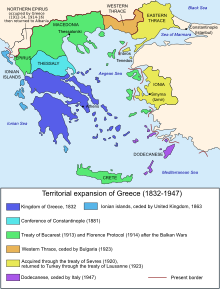 The Great Idea (Μεγάλη Ιδέα), the dream of uniting all Greek populations of the Ottoman Empire, thereby restoring the Byzantine Empire under Christian rule, led him to contemplate entering the Crimean War on the side of Russia against Turkey and its British and French allies in 1853; the enterprise was unsuccessful, and resulted in renewed intervention by the two Great Powers and a second blockade of Piraeus port, forcing Greece to neutrality. In 1861, a student named Aristeidis Dosios (son of politician Konstantinos Dosios) attempted to murder Queen Amalia, and was openly hailed as a hero. His attempt, however, also prompted spontaneous feelings of monarchism and sympathy towards the royal couple among the Greek population. While on a visit to the Peloponnese in 1862 a new coup was launched and this time a Provisional Government was set up and summoned a National Convention. Ambassadors of the Great Powers urged King Otto not to resist, and the king and queen took refuge on a British warship and returned to Bavaria aboard (the same way they had come to Greece) taking with them the Greek royal regalia which they had brought from Bavaria in 1832. It has been suggested that had Otto and Amalia borne an heir, then the King would not have been overthrown, as succession was also a major unresolved question at the time. It is also true, however, that the Constitution of 1843 made provision for his succession by his two younger brothers and their descendants. He died in the palace of the former bishops of Bamberg, Germany, and was buried in the Theatiner Church in Munich. During his retirement, he would still wear the Greek traditional uniform, nowadays worn only by the evzones (Presidential Guards). Αccording to witnesses, Otto's last words were "Greece, my Greece, my beloved Greece". ^ "Salzburger Schlosskonzerte website". Salzburger-schlosskonzerte.at. Archived from the original on 6 July 2011. Retrieved 11 July 2010. ^ a b c d Petropulos, John A. (1968). Politics and Statecraft in the Kingdom of Greece. Princeton University Press. ^ a b c Clogg, Richard (1979). A Short History of Modern Greece. Cambridge University Press. ISBN 0-521-32837-3. ^ Dean Karayanis, Catherine Karayanis, Regional Greek Cooking, Hippocrene Books, 2008, p. 262. ^ Tung, Anthony (2001). Preserving the World's Great Cities: The Destruction and Renewal of the Historic Metropolis. New York: Three RIvers Press. pp. 256–260. ISBN 0-609-80815-X. ^ Pacifico was a Jew of Portuguese nationality, merchant and the Portuguese Consul in Athens, who accidentally was also British citizen because he was born in Gibraltar. After a robbery in his shop he asked for compensation from the Greek state but nobody paid attention to him, not even the Portuguese government. Finally, he asked for help from the British ambassador, and his case was turned into the blockade of the port of Piraeus by the British Fleet. ^ a b Brekis, Spyros (2003). Ίστορια της Νεώτερας Ελλάδος [History of Modern Greece] (in Greek). Dümler, Christian, and Kathrin Jung. Von Athen nach Bamberg: König Otto von Griechenland, Begleitheft zur Ausstellung in der Neuen Residenz Bamberg, 21. Juni bis 3. November 2002. München: Bayerische Schlösserverwaltung, 2002. ISBN 3-932982-45-2. Hyland, M. Amalie, 1818–1875: Herzogin von Oldenburg, Königin von Griechenland. Oldenburg: Isensee, 2004. ISBN 978-3-89995-122-6. Murken, Jan, and Saskia Durian-Ress. König-Otto-von-Griechenland-Museum der Gemeinde Ottobrunn. Bayerische Museen, Band 22. München: Weltkunst, 1995. ISBN 3-921669-16-2. Chisholm, Hugh, ed. (1911). "Otto" . Encyclopædia Britannica (11th ed.). Cambridge University Press. 1Head of military/dictatorial government. 2Head of rival government not controlling Athens. 3Head of emergency or caretaker government. 4Head of collaborationist government during the Axis occupation (1941–44). The generations are numbered from the ascension of Maximilian I Joseph as King of Bavaria in 1806. This page was last edited on 1 April 2019, at 22:52 (UTC).